- Its extensive and unique database in 3D covers more than 14,000 of the most widely consumed food and beverage items in North America. 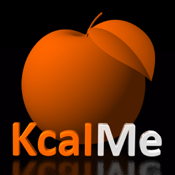 - Nutrient data tracked has been voluntarily limited to calorie intake to keep KcalMe easy to use unlike other more complicated applications. No need to keep track of carbohydrates, lipids, proteins or other nutrient data which only specialists understand and make it harder to determine what to eat. - Its positive straightforward approach avoids counterproductive guilt ridden rhetoric often found in other applications. - Seeing your 3D avatar change as you eat and drink during the day makes it easy to understand the calorie impact of what you eat. This fun and user-friendly tool will help you to evaluate the global calorie intake associated to your meals and therefore assess their compatibility with your chosen weight target, without making an obsession of it or generating unnecessary guilt. To help you to manage your meals, your 3D avatar is updated after each food or beverage selection so that you keep track at all times of you calorie intake versus your assigned objectives. LEARN TO PLAY WITH CALORIES WHILE HAVING FUN! - Over 14,000 products referenced (foods and beverages). Includes both commercially prepared and homemade items. - A ranking of the most widely consumed foods and beverages for even quicker access. -Intuitive selection of quantities and packaging in 3D by simply sliding your finger. -Optional Morphing effect applied to your 3D avatar when exceeding daily calorie allowance. -The number of calories (Kcal) per 100 grams. Newly edited items are automatically added to your favorites and can be accessed through the search feature. If desired by the user and once reviewed new entries will be integrated and made available in future releases of KcalMe. Meet us at http://www.kcalme.com to share your experience with us.